Deb's Cup of Tea: I Go, Too? I had to go to Iowa last weekend on business. Generally, I like to bring the suitcase out at least 24 hours in advance so the girls know I'm going to be leaving them. As it was an overnight, I didn't do that this time. 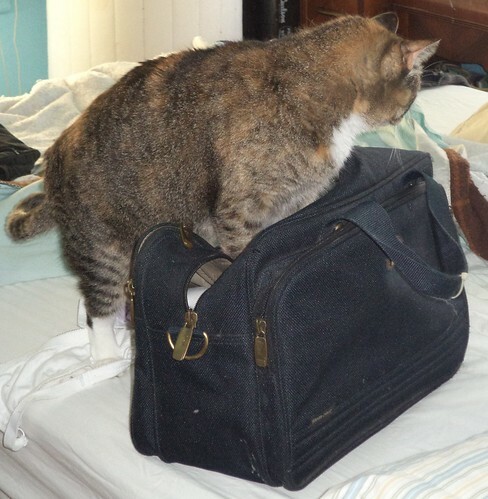 I pulled the overnight bag out and dropped it on the bed, then took a shower. When I finished and came back into the bedroom, she was there. It's such an emotional tug when I have to leave. I know the girls are in exceptional hands with Pam checking in on them. Yet, they are such a part of my life that I struggle with going places. Perhaps that's as it should be. If I was quite cavalier in leaving them, I probably shouldn't have cats. oh, we know how you feel! I hate leaving my little loves, even for a night! They seem to be ok, except for Rocky who meows at me the whole time I'm walking out the door, and Doodle, who gives me a look of misery as soon as I put on my coat. But when you come home the hugs will be even better! :) - Alana.